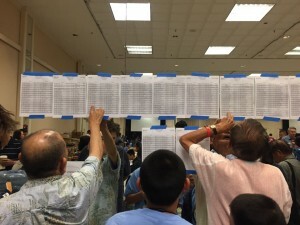 Monday’s Congress coverage: The E-Journal’s live coverage on Monday, August 7 begins with a preview of the day — and an overview of Congress tournaments with E-Journal Tournaments Bureau Chief Karoline Li — on YouTube and Twitch at 8:30a PDT, and broadcast of Round 3 of the U.S. Masters top boards starts at 9a on YouTube/Twitch and KGS, with pro commentary starting around 10a. Coverage of the Redmond Cup continues on all three platforms at 3p. Starting at 7p our coverage of Round 4 of the U.S. Masters will be carried on YouTube/Twitch and KGS, with pro commentary starting about an hour later. US Open/Masters crosstabs published: Tournament crosstabs for both the US Open and Masters are now up. If you believe the wrong result has been posted, contact the Tournament Director at Usopen@gocongress.org. Game records reminder: To get your game records added to the official US Open crosstab, email your sgf files to us at journal@usgo.org. Be sure to complete the game information with both player’s names and the game result. For best results, please send them in by 6p on the day the game is played.